Richard would like to raise awareness and funds to help of some of the UK's threatened trees. 100% of the money raised from the sale of some of Richard's drawings of trees in danger is donated to environmental charities – to help protect not just the trees in the drawings but also many other threatened UK trees and woodlands. A rural area between Ryarsh and Addington is currently under threat by a proposed Quarry. This is Richard's drawing of a wonderful oak in Ryarsh. This tree and many others like it could soon be destroyed. This original, unframed pen drawing is for sale to the highest bidder. All money from the drawing's sale will be donated to the registered environmental charity of your choice. This auction ends at 10pm May 1st 2019. To make an offer, please contact Richard using this site's 'contact' form. The winning bid will be announced on this page on Saturday 4th May 2019. Thank you for your support. An area of natural beauty is currently under threat by the proposed A27 Arundel bypass in West Sussex. 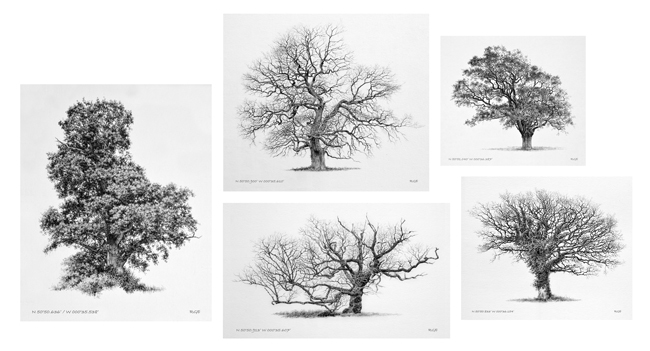 Here is a selection Richard's Binsted oak tree drawings. Each of these trees currently stands in the path of the proposed dual carriageway. One of these original unframed pen drawing was sold to the highest bidder – Mike Tristram from Binsted, Arundel. All money from the drawing's sale was donated to two environmental charities chosen by Mr Tristram. The winning bid was announced on Twitter on Monday 20th November 2017. Richard will continue to draw trees in danger and aims raise more money for environment causes. Thank you for your support.